Celebrity nutrition and fitness expert JJ Virgin teaches clients how to lose weight and master their mindset so they can lead bigger better lives. She is the author of 4 NY Times bestsellers: The Virgin Diet, The Virgin Diet Cookbook, JJ Virgin’s Sugar Impact Diet, and JJ Virgin’s Sugar Impact Diet Cookbook. Her memoir Miracle Mindset: A Mother, Her Son, & Life’s Hardest Lessons explores the powerful lessons in strength and positivity that she learned after her son Grant was the victim of a brutal hit-and-run accident. JJ hosts the popular JJ Virgin Lifestyle Show podcast and regularly writes for Huffington Post, Rodale Wellness, and other major blogs and magazines. She’s also a frequent guest on TV and radio shows and speaks at major events. 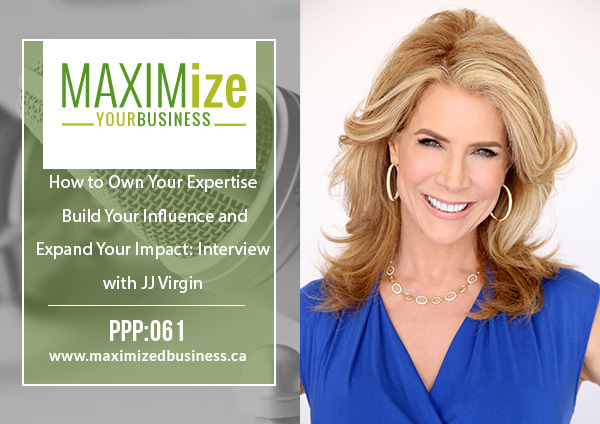 In addition to her work with nutrition and fitness, JJ is also a business coach and founded the premier health entrepreneur event and community, The Mindshare Summit. How do you help people determine their self-worth in their business? How should someone go about establishing themselves in a particular field to become an expert in a particular field? What are some ways people can grow their following? How can people expand beyond the walls of their business to create multiple streams of incomes? What does it actually look like to create a brand? Can you talk about the day to day schedule? How JJ got into nutrition and fitness and then became an entrepreneur. The first thing she tells people in her mastermind to do when they want to grow their business. Why she encourages people to focus on who they want to serve. The importance of understanding how to work with and actually help people over getting half a dozen certifications. How JJ grew her “portable” business.